Cape Town is one of the foodie capitals of the world, and you can easily taste the cultural diversity of Africa in the many amazing restaurants that operate in the CBD and surrounds. Capetonians know what good food tastes like, and that’s why we only have the best of the best to offer those visiting. And fortunately, many of these great restaurants are accessible with the Red Bus! 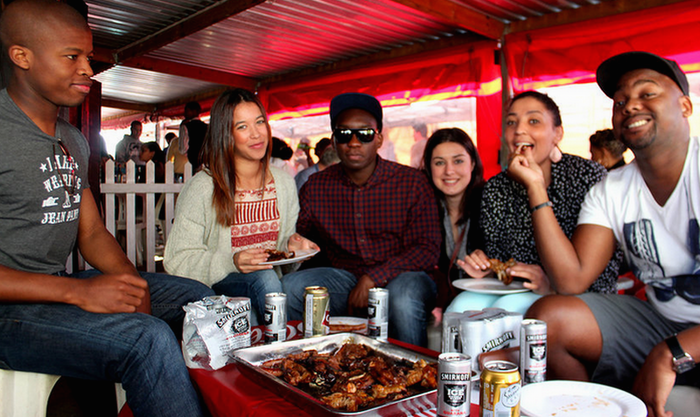 Cape Town culture is built upon the many diverse nationalities that have called the Cape home for hundreds of years. People flocked here to trade from all over the world, with many of them taking up residence. Over the years our own brand of culture formed, and as a result, we have a number of dishes unique to South Africa, and many more dishes from around the world and across Africa. We encourage everyone who visits to sample these authentic cuisines for a true taste of South Africa, and as they say, the best way to get to know a nation is through the food they eat! Keep our City Sightseeing Map and Timetable on hand and go with an empty stomach to enjoy all the city has to offer. The GOLD restaurant isn’t just a place to eat; it’s an evening of entertainment and a culinary safari of flavours from across the African continent. 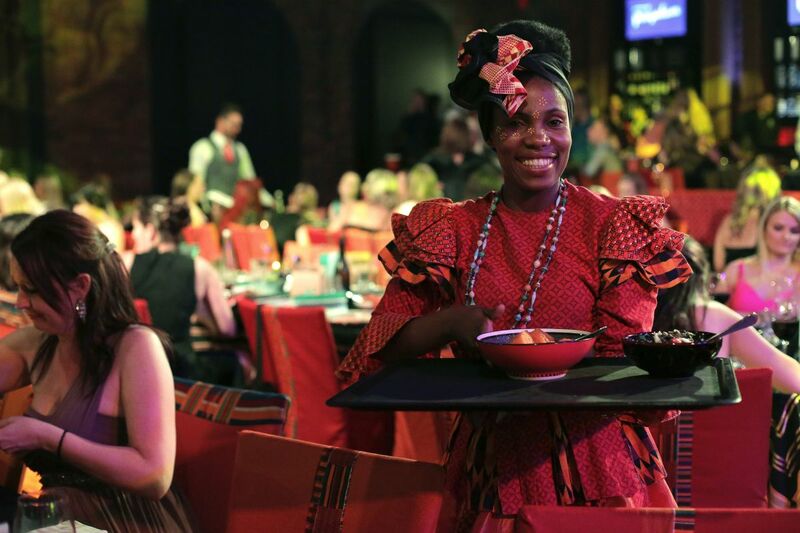 From drumming to giant man-sized puppets and traditional dancing, there’s always dinner with a show, and the set menu is a delicious array of authentic African dishes, with a set menu of 14 dishes that will take you from Cape Town to Timbuktu! It’s an experience you won’t want to miss, and it can finish with a 24-carat gold dust explosion. You can reach GOLD from our stops, STOP 1 or STOP 2, at the V&A Waterfront, within a short walking distance. The restaurant is fairly close to most hotels in the area and is open from 6:30pm to 11:00pm weekly. 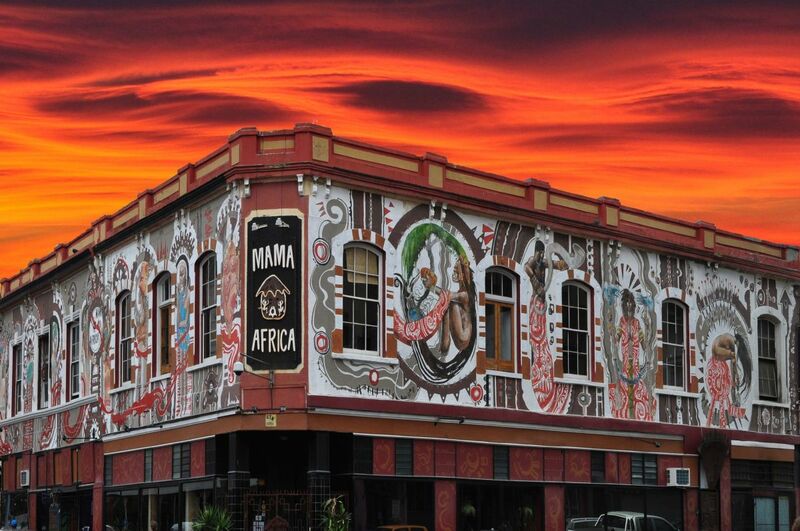 Mama Africa has been around since 1995, just after the end of Apartheid, and they have been serving authentic African cuisine ever since. With a traditional African band playing every evening they serve unique, gamey meat platters that include crocodile, kudu, ostrich and venison. They also offer a dessert platter to finish off. Mama Africa is located a short walk up the road, towards the mountain, from our City Sightseeing STOP 5. Long Street is always worth a visit, with many bars, restaurants and shops to visit, including the large Green Market Square with all its curio and memorabilia stalls. 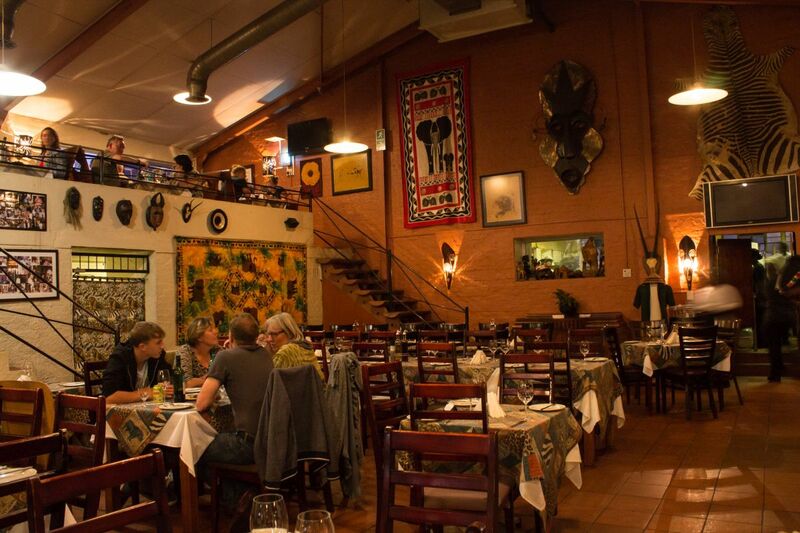 Located in the colourful residential hub of Bo Kaap, Marco’s African Place is a popular haunt for both international and national customers looking to enjoy some good African cuisine. From pan-seared duck to ox tongue. These dishes are a mix of local, pan-African and international dishes, all bound to be your favourite. Marco’s African Place is a short 6 minute walk away from our City Sightseeing STOP 5, and additionally we offer FREE Bo Kaap walking tours from our Long Street office, giving you a chance to explore this historical Cape Malay suburb before enjoying your dinner or lunch. Found in the lively area of Woodstock, aMadoda Braai and Restaurant is the perfect place to savour South African braai flavours. Inspired by the townships, the restaurant is laid back but vibrant with music and chatter, serving people from all walks of life. Listen to the upbeat Kwaito and African music while chowing down on famous South African braai meats, as well as pap and chakalaka. 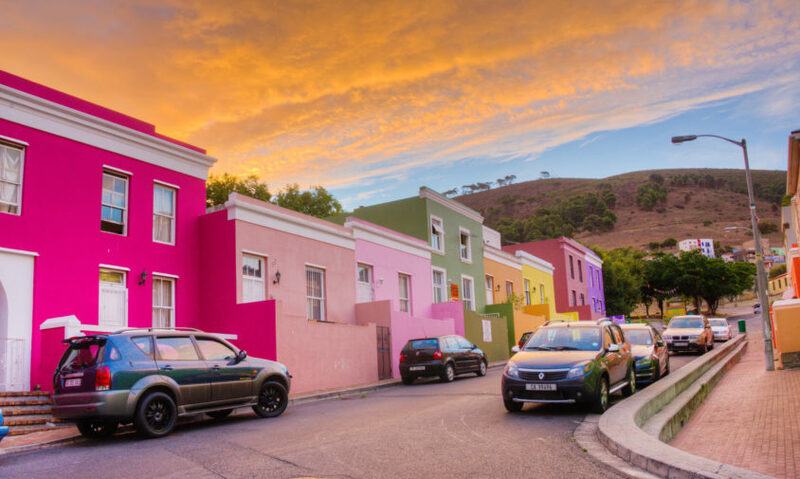 Another gem nestled in the top corner of the Cape Malay Quarter is the Bo Kaap Kombuis, run by local residents with the flair and hospitality the area is known for. They welcome you with open arms and share with you not just great Cape Malay foods, but stories of the area’s history and culture. So sit back and enjoy your delicious butter chicken, bobotie or lamb Panang curry while looking out over the spectacular view of the mountain and the city. This venue is about 16 minutes walk from the City Sightseeing Long Street stop, STOP 5. So you can walk it, or catch a taxi there if need be. They are open from 12PM to 4PM for lunch and 6PM to 10PM Tuesday through to Sunday, 12PM to 3PM on Sundays and closed on Mondays. 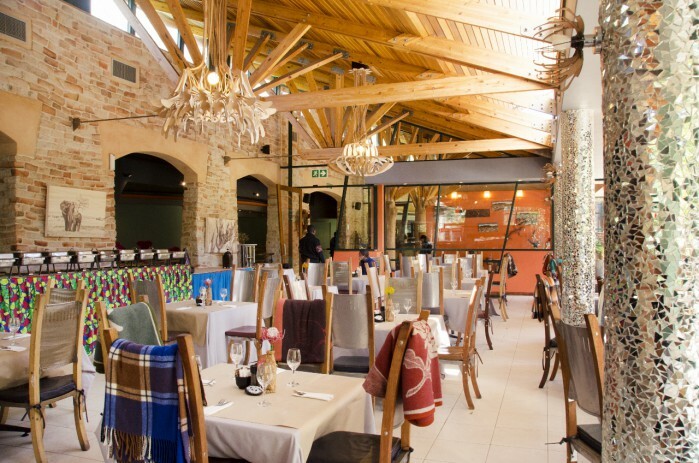 Mzoli’s Place is famous amongst the International community and is even one of Jamie Oliver’s favourite restaurants in Cape Town. 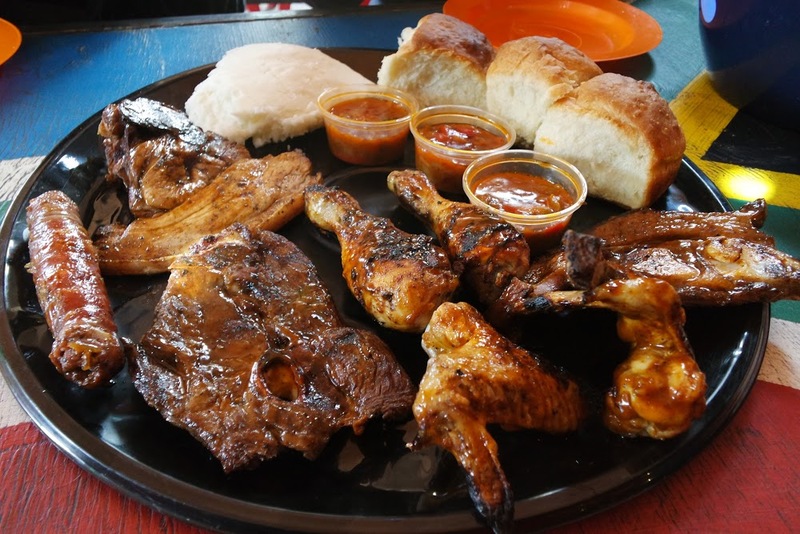 This authentic outdoor shisa nyama (braai), located in the heart of the Gugulethu township, promises a memorable Saturday or Sunday lunch, where visitors can pick their own meats from their on-site butcher. Beef, lamb, chicken, pork and boerewors, once bought, the braai masters will cook your meats to marinated perfection. There are drinks available next door, and the place is lively with music, dancing, and local chatter, with patrons from far and wide. City Sightseeing offers a half day Langa and Gugulethu tour, where visitors get to explore and learn all about the culture and history of Cape Town’s oldest and largest townships. On this walking tour you may get the opportunity to visit Mzoli’s place, or if not on the tour you can catch a taxi/Uber to Mzoli’s with ease. In the lush, green heart of Kirstenbosch Botanical Gardens, visitors can enjoy the authentic African flavours of MOYO, with its stylish decor and lavish comforts. They serve authentic African cuisine as well as global favourites like burgers and fish and chips. And after you’ve enjoyed your delicious meal you can take a stroll through the gardens to walk it off. Kirstenbosch and MOYO are found at STOP 20 on the City Sightseeing Blue Route. Entrance to Kirstenbosch Gardens is an additional fee of R70 per adult and R20 for kids 6 to 17 years (under 6’s enter for free). MOYO is usually open from 11AM to 6PM in the week, but they open at 9AM on weekends and close at 11PM on a Friday. 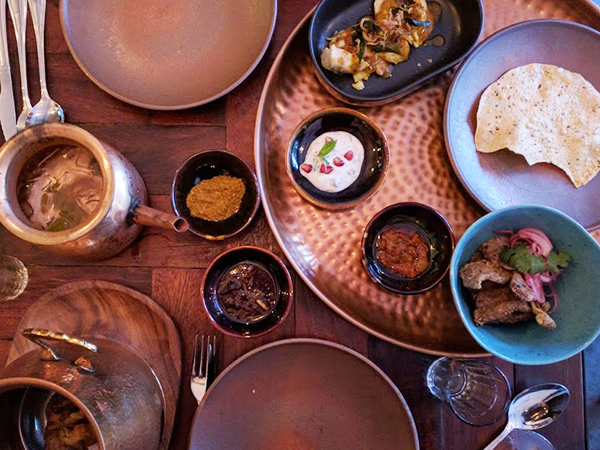 Back in the day the Cape Colony and much of South Africa became home to Indians, and they brought with them much of their culture, traditions and most importantly, their flavours to add to the mix. We do love great Indian Cuisine, and few do it as well as Thali. With its laid back atmosphere and tapas-style dinner, you can just sit back and enjoy the many wonderful flavours and dishes that are presented to you. This venue offers Tapas for two for R650, with no a la carte menu, to ensure you get the full spectrum of traditional Indian flavours. They are open 12 PM to 2:30 PM and 5 PM to 9:30 PM most days of the week, and are closed on Sundays and only open in the evenings on Mondays. Book your City Sightseeing Red Bus tickets with us to explore Cape Town, and to make sure you get to visit most of these wonderful restaurants at least in the day time. Remember to always arrive at the stops on time not to miss the bus, and remember to tip the waiters 10% of the bill at whatever restaurant you visit, unless it’s included as a service charge. And with that, a taste Safari awaits!